Almost all attendance records in the USA were beaten here. It’s the oldest university football league in the country and the biggest one by stadium size. Big Ten covers north-eastern United States and is split into two divisions. With three latest additions we’ve just completed the East Division of Big Ten. It’s the bigger one, average size of the seven stadia is 78,758!!! All stadia of Big Ten can be found below, new additions marked with blue icons and those we already had covered with black icons. The stadium’s name is derived from Induana University’s former home ground, which stood significantly closer to Bloomington’s center. The new one was located near the northern end of the city, initially with two massive concrete stands. Both of them exist today, nearly unchanged. West side is dominant in terms of scale and no wonder, it offers stunning 107 rows at peak. With this kind of size capacity was nearly 50,000 already upon opening in 1960. In 2003 the grandstand rose further, at least in terms of height, when new tower for commentators and corporate viewers was built. The largest change to date came in 2008-2010. This is when new north stand was built, completing the oddly-shaped horseshoe stadium. This is where majority of the business seats are located currently. They face another addition from 2010, large scoreboard in the south, 28-meter wide. From opening onwards the stadium serves Indiana University’s sports and other mass events. Primarily of course the Big Ten team Hoosiers, established back in late 19th century. Rutgers University is often referred to as the home of collegiate football. First game between two universities in this location took place back in 1869! Well, not exactly in this place, but some 1.4km (almost a mile) south-east, on the other side of Raritan River. Current place for football was opened in 1938 as the first Rutgers Stadium. Current venue is actually the second Rutgers Stadium already, built in 1994. It was shaped as a very compact horseshoe with one large tier of bleachers (app. 30,000 capacity) and two upper decks along the sides (10,000). Initial capacity was 41,500 and proved too low for high-profile games. Expansion came as late as 2009, when new south stand was complete, fully enclosing the field. This added further 11,500 viewers, though would have been more if not for the financial crisis of 2008. Also, as phase one of these works, almost 1,000 business seats were installed between existing two tiers of the east stand. 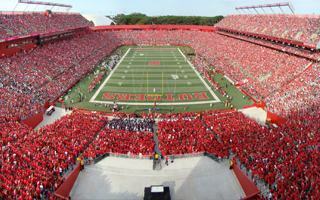 Ever since the stadium opened its name was Rutgers Stadium. This remains the most commonly used name to date, though in 2011 the first naming rights deal was signed with High Point Solutions. The stadium in western College Park was first opened in 1923, though the initial one wasn’t among the most impressive. With roughly 30,000 capacity at peak, this stadium had quite inconsistent stands, some built in concrete, some with steel. It also had a running track, a feature retained in the new stadium opened in 1950. This time with all stands very much the same, built on sloped land. It was shaped as a horseshoe with the curve in the west and, obviously, the east end open. It began operating with almost 35,000 capacity, but as the Terrapins football team grew, additional temporary sections were being added on top of the existing structures. By late 1980s, the stadium had a total of 22 such sections, achieving roughly 10,000 additional places. The landscape changes largely in 1991, when the south side received a 5-storey tower for press members and VIP guests, among other uses. Tyser Tower was joined that same year by new football facilities in the east, which were built in the place of the running track’s east curve. In 1995 another major addition came in the form of second and third tiers in the north, raising capacity to over 48,000. And finally in 2008 the Tyser Tower was expanded to huge sizes, accommodating 63 skyboxes and numerous other rooms. In 2006 the stadium received its first commercial name after University of Maryland signed a deal with Capital One. But, as unexpected as it may be, it wasn’t the commercial part of the stadium’s name that brought controversy. In 2015 opposition began growing against the name of Harry Clifton Byrd, prominent coach in the university’s history, who reportedly was a white supremacist.